All-in-one Wordpress Solution for AliExpress Dropshipping Business! Hi, my name is Yaros, and I started my dropshipping journey 2 years ago. Now my stores bring me 50K per month. When I was starting my dropshipping business, I could not find the right technical solution. I needed something special for my own needs. And there was nothing! That is why my team and I made this decision. We began developing our own dropshipping plugin for WordPress. So, we started growing our own dropshipping stores, and at the same time we were developing the plugin. I decided I want to share this experience with others. I have this thread called AliExpress Dropshipping Journey on Warrior Forum. Here I describe everything that we do in details and in real time. This thread is the most popular topic of the ecommerce section in the whole forum history. Here on Warrior Forum I share my knowledge and all the processes we do. Here I also read feedback from other dropshippers, and learn their opinions on our plugin. Their reviews and questions are priceless and we want to make an universal plugin that is convenient for everyone. We spent nearly a year on developing this plugin. We got lots and lots of comments and notes from dropshipping community. Thanks to this, now AliDropship Plugin is ready. This is 100% the best WP solution for AliExpress dropshipping business! just wanted to leave a quick review on this amazing plugin! so started 2 weeks ago after reading about it on a few different forums and i have to say it has paid for it self 3 times already!!! Really wanted to thank the alidropship support team for answering all questions diligently, simplifying the workings and literally holding my hand through some of the stuff i didn't understand at first, you guys are awesome! Thanks to Yaros for this wonderful plugin. It's making getting my store online so easy. Great job! Hi Guys. I recently got my hands on the plugin and and so far I absolutely LOVE this tool. Yaros has created something that is worth every penny for a store owner. There are many other features to this plugin that make it great but I donât want to turn this post into a tutorial. The one thing I came to post here was to say that if you are starting this business then this plugin is a MUST. The plugin awesome. their customer support is superb. If you have any problem regarding plugin ask them they will solve it. If you have to idea about starting dropshipping this is the best. I spent under an hour on the store and it looks amazing. I have a couple links and graphics still to change but nonetheless, a full functional store in less than an hour. I personally love the ease of use and haven't used anything like it. I am truly impressed as this is the solution of been waiting for. Thank You Yaros! Truly a developer that knows what hes doing and actually uses what he builds. I too was given the opportunity to beta test the plugin and I would like to thank Yaros for the opportunity. All I can say is, IMPRESSIVE! I found the plugin/theme very simple and easy to use. Thank You Yaros...Keep up the great work!!! Hello ppl, I start to using the Alidropship, since now I have one thing to say. The whole procedure is too simple... I choose the items that i want to import them to my e-shop. I used also shopify and oberlo but it was too expensive for me. I invest one time some money and now i am enjoying the automate procedures for life. Yaros you have done a great work with this script and i must say that i am too enthusiastic to be a member in your work. I have set up my store and also made my first sales with dropshipping plugin. Everything is working fine except Paypal, which gives error every now and then. They had some DDOS issues few days ago and none of my transactions went through, but this is not plugin's fault. Plugin works stable, its easy to use - 1-2 hours and shop is ready for traffic and sales. It solve the problem with technical part of this business, all you need is to pick a right niche and promote your shop, so you focus on promotion and SEO, not on technical problems and coding. And if you will read Yaros posts from this thread you will know how to promote your store with low cost or free methods. 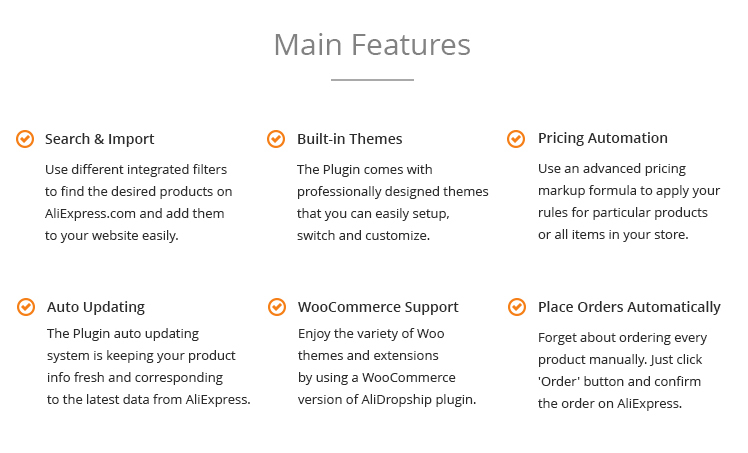 Re: All-in-one Wordpress Solution for AliExpress Dropshipping Business! Hmmm looks very interesting i must say! There are 5 review copies available. Please PM. Count me in for a review copy please. First, I have run both shopify and wordpress ecom stores in the past. I've always liked the fact that wordpress didn't have the monthly charges, but have been partial to shopify for ease of use and stock of features. so, easy to use. I had a spare domain handy, so thought I'd set up a test. I chose one of the themes they provide (which are beautiful by the way) and I set up a fully functional store with about 200 products, paypal integration, automated markups set, different shipping methods. EVERYTHING in about 20 minutes. The plugin integrates perfectly with aliexpress. you can either import products directly from within the plugin using the Ali api OR, you can search aliexpress and import products using the alidropship chrome extension (think oberlo for shopify). you can set your markups very easily as well as shipping types and charges. There were a few ideas I had that I mentioned to yaros. 1 was already in the works, he's looking into another.. he's very responsive and he's very open to suggestions. all in all super product, definitely recommend! $71 is a final price for Warriors with discount included. Wow, this plugin looks interesting. Right now I am in a planning for my mega project with 25 ecommerce developer. We will build e-commerce & flip it. This domain can be use on how many domain? Is this plugin have license for each domain? How can i get the copy? One plugin license is valid for one domain. PM me for a review copy. Hello Yaros is there any Service that you offer along with the ready website creation for Marketing . As I am looking for some support for Marketing Part. I don't have enough time to do that . Also other hand don't wish to throw money in Facebook Advertising and other Advertising area . You maybe seasoned with marketing so it can be really helpful if you can handle & help . Hello, I always share all of my marketing strategies with customers. You can take a look at my case studies in the blog and can follow the instructions. I can also recommend another our solution that is called SocialRabbit . This plugin works automatically and gives new stores a good boost on initial stages and later. Hello thanks for the reply still you need to write newer Posts for Social Rabbit also to upload images that will consume some time as well as Expertise . To Understand what works better . So you can see still there is some catch is there not possible to outsource from you . Hello, I always share all of my marketing strategies with customers. You can take a look at my case studies in the blog and can follow the instructions. I can always recommend another our solution that is called SocialRabbit . This plugin works automatically and gives new stores a good boost on initial stages and later. You can outsource some marketing tasks of course, but in my experience this kind of business always needs much control from its owner. I can't find any successful examples among my clients who just built a site and then passed it someone for promotion. I'm interested in your review copy. Please consider me. Thanks. I received a review copy/plugin and it is absolutely awesome, Yaro you have done it again.. I purchased Yaros other Aliexpress plugin and was not disappointed, it was easy to use, good themes and he over delivered when it came to customer service. I am fortunate to have been given a review look at this new dropshipping plugin and am just gradually building my site, a bit of editing needs to done as a lot of the translation to English is not that great. The knowledge base, the forum and the dropshipping blog is full of helpful information, techniques and ideas for marketing your site. I was surprised at the amount of members in this forum, it appears to have grown quite rapidly, many people have purchased and are sharing their experiences, it's a good starting place. I could go on and on so I will just say it gets a 10/10 from me. Hi Yaros, can I have a review copy? Yaros, can I have a review copy? Yaros, Please consider me. can I have a review copy? I just used the alidropship plugin, and I have to say it was everything I hoped it to be and more! I've made several stores both on wordpress, and shopify. I've typically done drop ship stores through shopify because of oberlo, but tried to used wordpress when available, because of the customization features, and price. I have to assume through my experience that oberlo has been one of the main factors in convincing customers looking into drop shipping to use shopify. The alidropship plugin has made it so that no longer has to be the case. With alidropship you get everything you have in oberlo, with the control of wordpress for your pages. Not familiar with wordpress templates? Well guess what alidropship has a wordpress version with already made templates, so you don't have to worry about the ins and outs of wordpress. Overall I'm extremely happy with finding alidropship, and the savings it will allow me to enjoy in the future! Thanks @Yaros!!!! What does happen to the products that are removed or sold out by the seller? Do those get updated automatically in the store through plug in? Seeing so much positive response for your product and responses for the Review copy , not sure if I can be lucky, please count me also in case you still can spare one for me. Yes, the plugin detects items that are out of stock or are not available anymore and sends them to draft. What is the upgrade price for current Aliexpress plugin owner to this dropship version? And how can I purchase it? I saw another message from you saying this dropship plugin is only for one domain, not 5 as affiliate? If this is the case, can I create multiple subdomains to use single license? I have purchased like in the past with your ali affiliate plugin! Reasson: very good support, on a regular time it will be updated AND it will be making your money like the plugins in the past! AliDropship plugin is valid for one domain only and it is a new product different from AliExpress affiliate plugin. Can you please list the different between affiliate plugin and dropship plugin? These are absolutely different business models. With affiliate site you just redirect visitors from your store to AliExpress where they complete a purchase and you get affiliate commission. With dropshipping you sell products directly from your site with your markup. Once you get an order you outsource it to AliExpress. New settings in auto-order section: mark order as ‘Processed’ and ‘Shipped’ automatically. Mark order as 'Processed': if you enable this option your order status will be changed from 'Paid' (Ordered) to 'Processed' automatically right after you placed the order on AliExpress. Mark order as 'Shipped': when Tracking ID is added to the order the status of the order will be changed to 'Shipped' and 'Order shipped notification' will be sent to your client automatically. AliDropship Google Chrome extension got some new features! Now you can see not only the method of delivery and its price, but the time of delivery and Processing time of products. Processing time means that it takes the company ex number of days to send you the products. Also you have a new possibility to import product from a category page with just 1 click! Click logo with a '+' sign and this product will be imported in your import list in a few seconds. You may click several products one by one, plugin will import them all - you don't have to wait while one product will be imported to import another. As you can see AliExpress's Score and AliDropship's Score doesn't match - this is because we use more complicated formula to get the result. We based our formula on such parameters as how long seller trade on AliExpress, his feedback, his communication, shipping speed and how accurate he is in product description. And how about this scenario, can you make it that we markup the price and when visitors order the items, they order with our price but the order takes on the aliexpress with real price and the seller gets notification that this order is a dropship from us. So the conversation followed after that will be directed to us. Can you make it? So everything is automatic unless there is following conversation from the seller. - Auto order fulfilment is done with click of a button. - The notification for AliExpress seller is sent automatically. Sorry perhaps my miss understood because of language barrier. when you "With dropshipping you sell products directly from your site with your markup. Once you get an order you outsource it to AliExpress." So, I thought "you outsource it to AliExpress" means I need to find a good product based on what the buyer order and buy it manually from a seller in AliExpress, so we need to make sure that the seller is valid. So, how do we know that the seller is valid and will not run away with money or send broken items? What will happened when it happen. Will it ruin our reputation? Or will the buyer know that our product is from AliEpress and instead ordering from us, the buyer will order directly to AliExpress because the price is cheaper there? To sell a product, you need first to find this product and import in your site. So you will learn about a seller when you import an item. Hi Yaros, Is there a feature in chrome extention to see what products you already imported to your store? Yes, you can see a check mark near the products that are already imported, besides the system will not allow importing the same item twice. If a product got multiple colours or designs, can we add an option to the web page to select for the customer? All products variations are added to your site with a product. Hi Yaros, I have some questions if you can please address? Does the plug in work with Big Commerce? If yes, what is required to make it work with BC? Is $71 WF price for a life time use for one domain with all the future updates? This one probably not associated with your product, but comes from my experience working with another Ali Dropship plug in before. Is there a time limit on the products uploaded from Aliexpress, i.e. 10 days etc. and would need the products reimported after that normal expiration period or once uploaded products are displayed until removed by the seller? How does the plug in handles the products which are not removed by the seller, but are out. Either all variations or some color/size. You earlier replied to this question, but I have additional question: You had mentioned the products that are removed by the seller are automatically updated in the store. Is there any intervention at all. I mean do I need to go to the plug-in and hit some button to update the removed products or it happens in real time? Would there be any after-sales support and help guides available? One more question Yaros, which is a big pain point for me if your plug in helps with that. Does the plug in also imports all the information from the Product Details tab including Product Specifics and Product Description? Product Description generally contains the Size Charts (for Apparel). Adding the Size Chart images later to the store consumes a significant amount of time and it would be really a big plus if Ali Dropship plug in has the capability to import all the information including Size charts. It is a WordPress plugin and it does not support any other platforms. You get a license valid for one domain with free support and future updates. The plugin updates the products and its variations automatically. If a product is not available on AliExpress you can set the option to send such item to Draft. Yes, it imports all these details. Can I manually add products from other sites like ebay? Will the plugin work with the WP Plan "Personal" ? Or I need "Premium" or "Business" plan in order to use your Plugin? Yes of course, you can add any products manually. I have never used this plugin, so I can't say exactly if it works. However, it is also a WP plugin, you can try it. Aliexpress pages generally contain a lot of hyperlinks to other products in the product descriptions section. Does the plug in removes or ignores the objects that have hyperlinks or imports everything? Can it selectively pick size charts and product descriptions only, but leave out objects (pictures and references to other products)? Is there a free trial period for a small duration when it can be checked if the plug-in will meet my needs?